Drop me a line when your free, got alot to catch up on. JustDavidP ... thanx my friend !! i am working on adding the video, but having some trouble getting photobucket, youtube, or googlevideo to upload it without stalling. Acropora Tortuosa is a fairly demanding SPS (small polyp stony) coral, that is held in high regards amongst SPS keepers around the world. It is considered to be one of the more demanding of the SPS family of corals. Acropora Hyacinthus is a VERY difficult coral to keep happy. It will require excellent water quality and flow to maintain its health in captivity. Like other Tabling Acros, the flow pattern and direction will dictate the growth pattern. 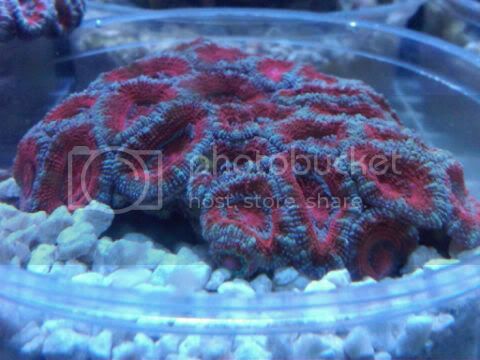 In my experience with Acans, they are far less demanding that any SPS coral in my system. They do not require intense lighting, insane amounts of water flow, or perfect water parameters. They are also some of my most prized possessions in my system, because of the insane color variations (mine are all Aussie Acans, but even the non Aussie's have crazy color morphs available to us.